What Is a King Cobra's Nest Made Of? The king cobra is the only type of snake on the planet to build a nest for her eggs, and she doesn't do it for the same reasons that animals like chickens do. While birds build nests primarily for incubating their eggs, the king cobra builds her nest primarily to keep the eggs safe, and that difference influences the materials she uses to build it. 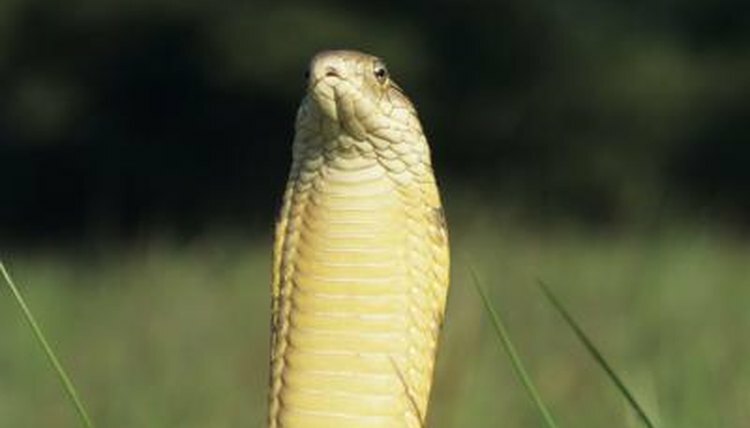 The king cobra can lay up to 40 eggs at a time, which means she has a lot to protect while waiting for them to hatch. She builds her nest by pushing together loose vegetation with her head, giving her a place to store the eggs together. This usually consists of leaves, weeds and other loose and rotting vegetation around the area. Once the eggs are all tucked in place, she covers them with more leaves and plant life, then rests on top of the pile. This allows her to camouflage and protect her eggs, and as a secondary benefit, the heat generated by the decomposing vegetation helps keep the eggs warm.